Fall is a busy time in the Wister Center Greenhouse. 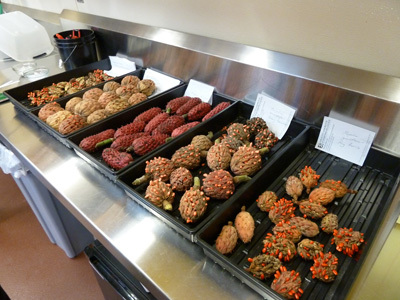 Volunteers work on a variety of jobs including taking cuttings of tender and tropical plants; potting up cuttings; overwintering succulent plants and this year they have been busy harvesting magnolia seeds to contribute to the Magnolia Society International’s seed exchange, The Seed Counter. 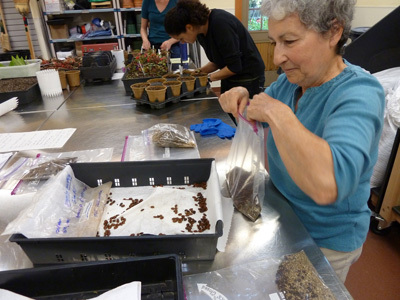 We have gathered seed from the Arboretum’s collections, as well as from the Henry Foundation in Gladwyne and the Morris Arboretum in Chestnut Hill. 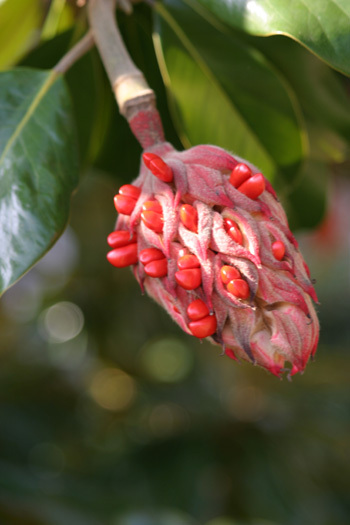 Most magnolia seeds are found in large cone-like fruits called follicles. Once the follicles open up and reveal the seed which is often red and covered in a waxy coat, the seed can be harvested. 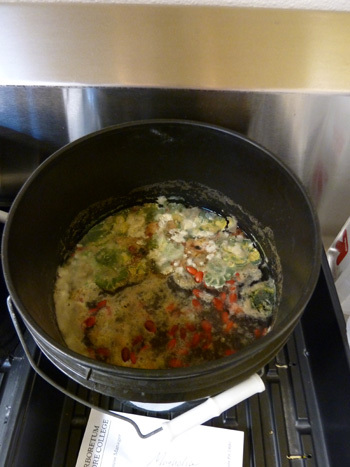 After the seeds are harvested, they are soaked in water for three days in order to loosen the seed coat. Our volunteers found the most effective way to remove the seed from the seed coat after soaking was to squeeze the fruit. The seed simply squirts out of the fruit. The seeds are then dried for a day or two. The seeds are packaged in slightly moist vermiculite and refrigerated. 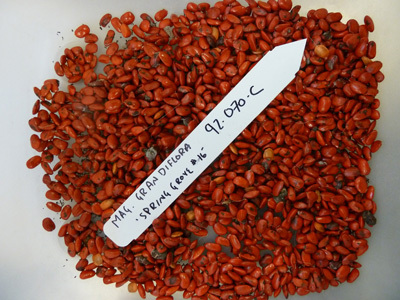 Do not store the seeds dry, because they rapidly lose viability under those conditions. The moist seeds are stratified for 2 to 4 months at 32 to 41 degrees Fahrenheit before planting. You can also fall- plant the seeds outdoors to allow nature to provide the cool, moist conditions for stratification. Throughout the process it is important to keep the name and the source with the seed. 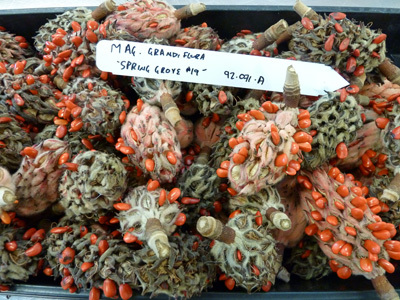 Those who subscribe to the Magnolia Society’s seed exchange will make their selections based on species and source. To learn more about the Magnolia Society International and to participate in the seed exchange go to: www.magnoliasociety.org. Also, consider attending the next annual meeting in the Bay Area and Sonoma Valley. As a whimsical aside on the wonders of seed germination, enjoy this video of our former summer intern, Jared Barnes impersonating our favorite super hero, Superseed. Happy propagating! PS Jared’s not just a seed. He’s a nut! done with the harvesting and they’ve been in the fridge since november. but where do i plant them? just in the ground outside (live in vancouver, bc), or in a pot in the house first? The seeds should either stay in cold storage until the spring or you could plant them in pots now and put them outside for the winter. It will be important to have to pots protected from rodents however. In the spring the seedlings should start to germinate and you can then separate them out into individual pots. I’m in Vietnam and I’m interested in collecting the different cultivar of Magnolia Grandiflora. I wonder where can I get these seeds? I tried the magnolia society link you provided but it’s not working. Many thanks for a great post on seed collection. To get Magnolia grandiflora cultivars you will need cuttings. I live in Southwest Florida. I am waiting on my follicule to open. Do I need to put them in the fridge for 2-4 months? When should I plant them, Fall? They can be direct sown, but may take longer to germinate. So, in SW Florida they do not need to be refrigerated and can be planted in any season? Hey i live in springfield mo and have always wanted a magnolia tree. my husband brought a pod home but its not bursting with the red seeds. can this be planted or is there anyway to extract the seeds for germination? There needs to be red fruits for you to get set. Then the seed can be extracted and planted. Seed in SW Florida can be directly sowed. I have been given a magnolia tree last year.It has flowered for the both years but I have not seen any seed pods. Could it be I will never get seed pods because I live in zone 4? Sara, I also brought a pod home early before the seeds were showing.So I decided to do a little experimentation, as I love to do when cultivating and sure enough it worked. If there’s still enough of a stem on it cut the bottom 2-3 inches off a pint spring water bottle fill with enough water to come up the stem about an inch or so place in a good sunny window in 5-7 days the red seeds will pop like it’s still on the tree. If urs is already dried out might not work. But just grab another fresh pod off a tree and get going. I live in so Indiana and have a magnolia tree full of seeds in my yard. I want to use the red seed for beads, but have not found anything to keep them hard and bright red. I’ve sprayed them with polyurethane , but once I poke the hole to string, they start turning black. How often do the pods fall from the tree? They are very difficult to rake, not able to use the blower to move them. My experience is that once the outer seed coat starts to dry that it will ultimately turn black. I don’t know how to preserve the red color. Question: How ripe do the pods/cones have to be before I can remove them from the tree, or do I have to wait for them to drop? I am competing with a squirrel & bird population who seem to always be able to get to them before I do! Can I take them off while they’re still green, and ripen them artificially in an area not accessible to the critters? Thanks in advance! Once they begin to open and show a bit of the ripe seed then you can harvest them. I think it is difficult since red flesh quickly turns to black. I have Magnolia Grandiflora Seeds for sale. I can ship them worldwide. We have a large magnolia tree in our front yard. These last few days we have picked up 70 a day. We have been throwing them away. Seem like a big waste to me. I would gladly save them if somebody near by has a use for them. I live in Gulfport,MS. One year my Dad picked up close to 2000 of them. Thank you for sharing Mary. I hope someone can put them to good use. Otherwise they look great in wreaths and holiday decorations. My Mongolia tree only grows these pods with red berries Will it ever bloom the white flowers? I am so disappointed. Seeds are only produced after a plant has flowered, so it some point your Magnolia did flower. My seeds are red but when I get into them to get the inside seed out its a reddish orange and not black. Do I need to let them ripen more? your pictures and info are much appreciated thanks. 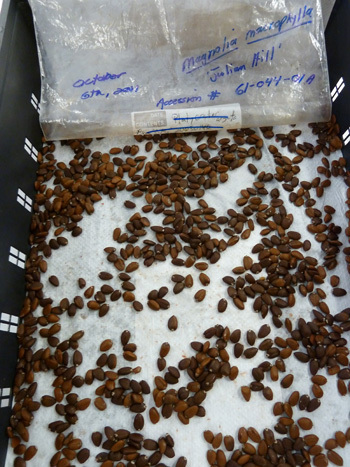 Magnolia seed has the best germination rates when harvested, cleaned, and sown as soon as possible. Fresh seed is the way to go! Magnolia stellata needs a cold period (at least 2 to 3 months) for germination. I sow freshly cleaned seed in rounds (multiple seeds per pot) and place in a critter-proof frame outdoors (chipmunks, squirrels, and other animals love to eat the seed and/or dig through the rounds to bury their nuts). Come spring you should be rewarded with young stellata seedlings. The Reference Manual of Woody Plant Propagation by Dirr and Heuser, Jr. is a great resource as is the Magnolia Society International website. Happy germinating! Hi just wondering if the flower has to be pollinated to produce seeds because my neighbours tree has only had one seedod that made seeds. I know that most flowers need to be pollinated to do this and i was hoping that i could hand pollinate them. I found some dried seed pods in the woods around my house in WV. I guess these are called Mountain Magnolia. I don’t think they are very common as wild trees in this area. I am so excited to wait for the trees around the pods to bloom and possibly get some fresh pods this fall. Any advice is appreciated! I have a large old magnolia in my yard and its blooming and dropping seed pods right now. I’m a little confused because they’re either green pods, with soft green seeds inside (if broken up) or brown with flat dried up looking seeds. Neither are showing red seeds. Will it work to break open the green pods and plant the green seeds or is there another time of year when it’ll produce pods with red seeds? Thanks! I live in Texas and am going to try to grow some magnolia trees from seed. I just brought in two pods and removed the red coating and was surprised to see that my seeds were tan not black. Will they turn black as they dry? Is this a different variety perhaps? What species of Magnolia did you get the seeds from? Each species of Magnolia seed varies ever so slightly in color. Tan, light brown, and gray seeds all occur. The trick for successful sowing and germination is to sow seed immediately after removing the fleshy red fruit (or refrigerate until you can sow). Cleaned magnolia seed doesn’t like to dry out. Good luck! Good job. It’s a great article.